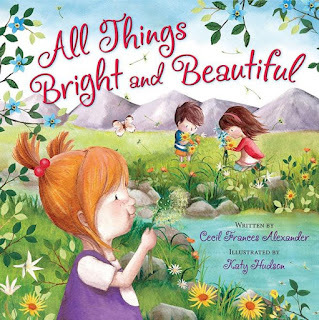 "All Things Bright and Beautiful" written by Cecil Frances Alexander and illustrated by Kathy Hudson, is a beautiful hardcover book that is sure to bless anyone who reads it. "All Things Bright and Beautiful" was originally a hymn published in 1848. This hymn is one that I sang when I was in a children's choir and so this was a special book to share with my own children. The illustrations by Katy Hudson are adorable and show three kids enjoying God's creation. The children see many beautiful animals and flowers throughout the day as they play in the sun and wind. The end of the book shows nocturnal animals as the family goes to sleep in their tent. You can't help but feel appreciative of all that God has given us when you read this book. This book is 'bright' and 'beautiful' and highlights the amazing creation all around us. Win it: One Sowing Dandelion Seeds reader will win a copy of the book "All Things Bright and Beautiful". animals! I love they hymn how great thou art! I think the animals are beautiful and wonderfully made! its hard to choose just one. babies. forests. the ocean. the night sky with stars. a full moon. My favorite hymn is it is well with my soul! I think the beauty in God's creations is the love that He has in creating all of this world for His children. My favorite hymn is the Spirit of God. I think the sun is the most beautiful of all creations. i am always in awe of the changing of the seasons! All things are beautiful in there own way. I think animals and plants! Everything....beauty is in the eye of the beholder. I think cherry blossoms are beautiful. I think flowers are beautiful and kitties and puppies. I would love this for my niece and nephew please! The illustrations are amazing. kristiedonelson(at)gmail(dot)com Thank you. My favorite hymn is "Imagine." Beautiful. kristiedonelson(at)gmail(dot)com Thank you. I think babies are a beautiful example of God's creations! I love the Christmas hymn Away in a Manger, It is so sweet. I tried to sign up via GFC. I am not sure if it "took". I am in awe of the clouds that the Lord design each and every day. We have an amazing God and all of His creation is amazing! My favorite hymn is "I Stand Amazed"